I’ve sold my car half a year ago. I bought an awesome mountain bike (cross-country) for more monies than I got for that car. I managed to destroy my suspension fork. No biggie, it has warranty. I want something that will be more suitable for the type of riding I sometimes do and will do more often. I would like a new Trail bike, built for it. I fell in love with Specialized Camber Carbon 29” trail bike. It is a mountain bike designed with 29” wheels in mind and built for trails with all kinds of roots, rocks and jumps. 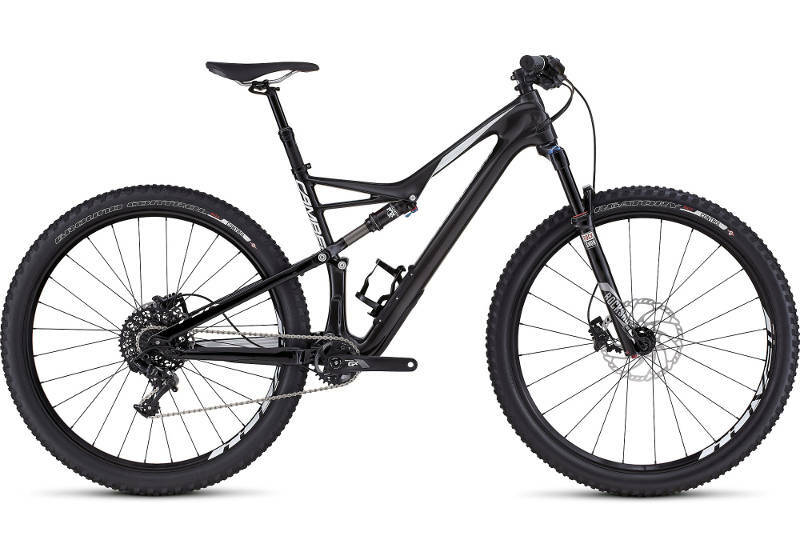 It’s a carbon bike, making the robust construction bearable in weight, with RockShox & Fox suspension. Much better than what I have on my “old” XC (cross-country) bike. All the components are much better. Just brake rotors are almost twice in diameter. One of my key requirements for my new bike was a dropper seatpost. I would often get my skirt stuck behind the seat on my XC when going behind the seat to move my weight back while descending or braking. Dropper seat post gives you the ability to control the height of the saddle with a button press, easily switching between comfy pedaling height and saddle-out-of-the-way height. Another really cool feature of this bike is a sneaky hidden compartment inside of the carbon frame, where I can store some emergency gear to repair tyres and multi-tool, and my first aid kit. Yes, I carry basic first aid stuff around in case any of my friends gets injured, already used it once. Camber has much slower gears than my old bike. I do like some speed. Camber has 28 tooth chainring, so called one-by. My XC had 44 highest gear, making it much much faster. To be more specific, Camber comes with gears that will give me a ratio of 2.80 while the XC had a ratio of 4.0. To make it even worse, the lowest gear on Camber has the ratio of 0.67 while XC had 0.65, making it less cool up the hill. In the table above we can see that the 32 chainring has a ratio just below the 2nd gear on XC and 34 chainring would have a ratio just above the 2nd gear on XC. 32 or 34? Or just keep it stock? The question is obvious… Should I take 32 and have good low gears, or do I want 34 to get higher top speed by 2.4 km/h but sacrificing whole 0.05 ratio up the hill? I’m leaning towards 32 as it is somewhere between the two lowest gears on my XC bike. And 2.4 km/h of the top speed won’t make the difference. Feel free to leave me your opinion in the comments below, or on twitter, or Discord.